Stock photo of a white daisy flower set amongst the vivid purple spikes of lavender plants. 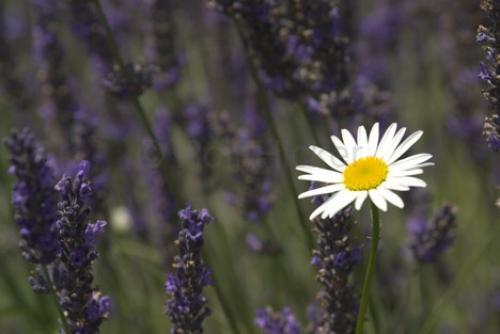 Stock photo of a Daisy Flower amongst lavender plants. I stumbled across this beautiful contrast of flower types the vivid fresh white of the daisy flower and the stunning bright purple of the lavender creates a beautiful backdrop in this picture. January is a spectacular time in New Zealandwith plants in full bloom both wild and tended. I suspect that this is a stray daisy flower but it definitely adds extra character to this shot. Whenever travelling through New Zealand in the summer be sure to check out the many boutique and unique gardens. If you have a New Zealand car rental and are traveling independently, be sure to ask at a visitor centre about these boutique market gardeners, who often have a small retail outlet onsite.